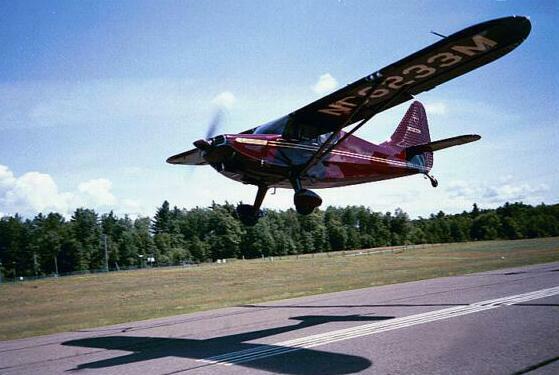 Butch and Carol Walsh take off from Minocqua, Wisconsin (ARV) on their way to Oshkosh 2000. Photo taken on July 23, 2000 by new owner Charles Hauser. Butch Walsh of Arrington, Virginia passed away on May 11, 2006. He was perhaps the premier Stinson restorer in the World. His 108-3, NC6233M (converted to a 108-5) won the Grand Champion Classic Award at Sun 'n' Fun 2000 and Oshkosh '99. It has won numerous other awards since its completion in 1999. 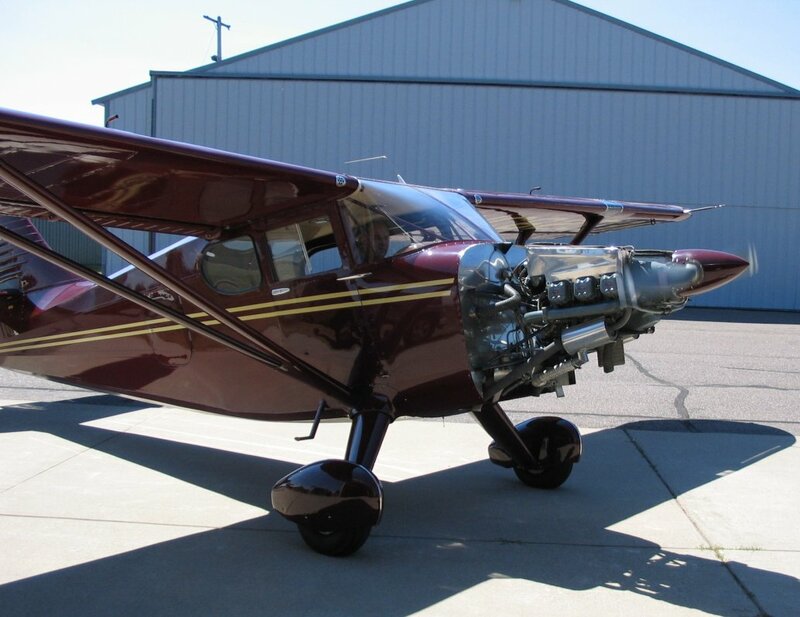 Butch said he restored this plane to honor the late George Heinley, the old Franklin engine master. 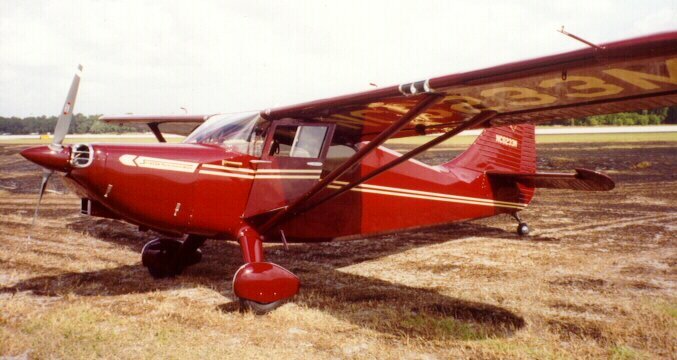 NC6233M was once owned by George. 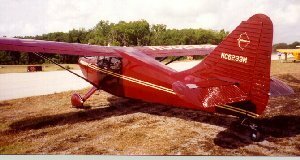 Butch later sold 33 Mike to Charles Hauser who keeps the plane in Wisconsin. Parked on the burnt grass at Sun 'n' Fun, awaiting takeoff for the parade of flight. Here are two interior shots. Notice the original Halicrafters radio to the left. It's really just a clever false panel, removed with two screws. 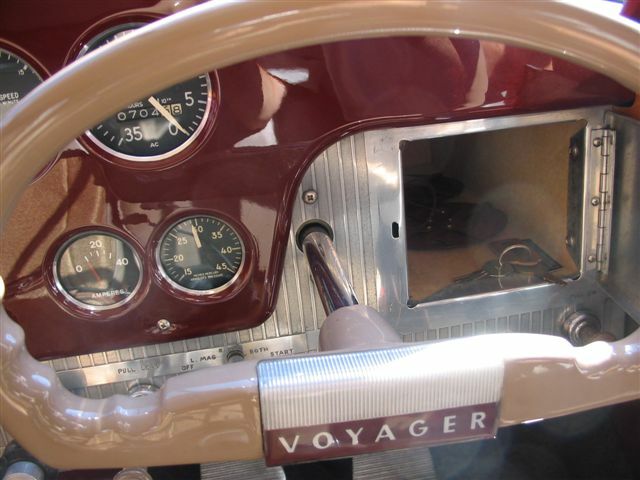 Once removed, the avionics trays are uncovered and the Garman GPS/Comm and the transponder can slide in. The vintage microphone, though functional, is just for show. 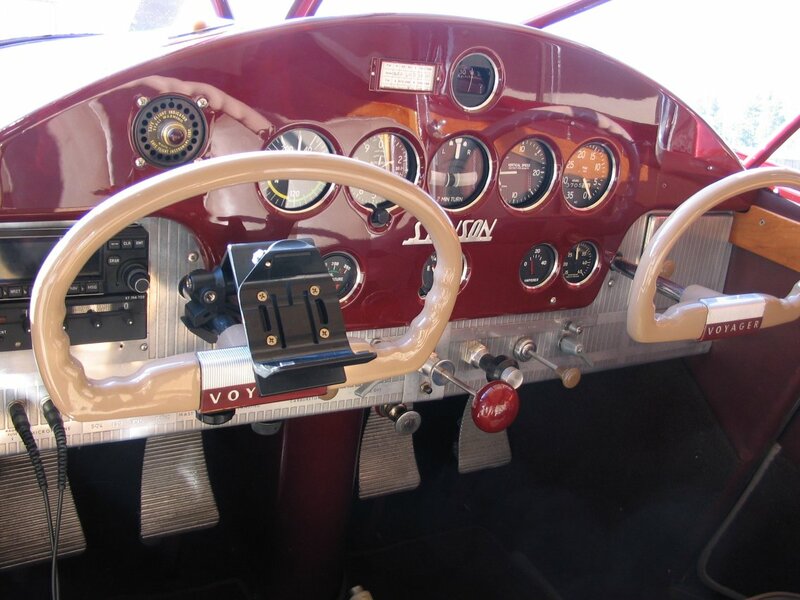 For flying, Butch uses a headset and a portable push-to-talk switch velcroed to the yoke. On the right you can see the Franklin 180 installation. 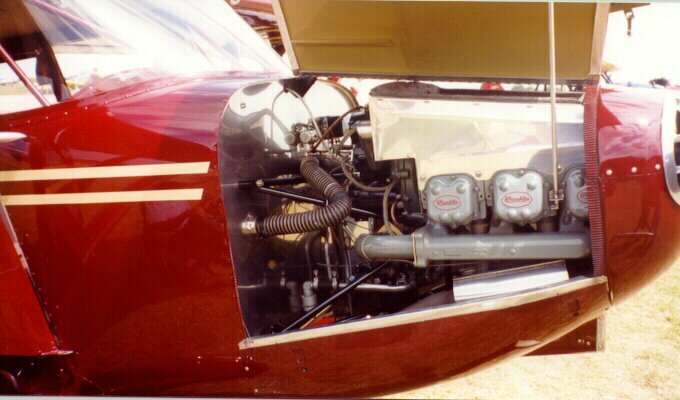 This engine was certified in the Stinson and the model designation for the aircraft was then 108-5. Notice that the battery has been moved out of the engine compartment to offset the weight of the constant speed prop. 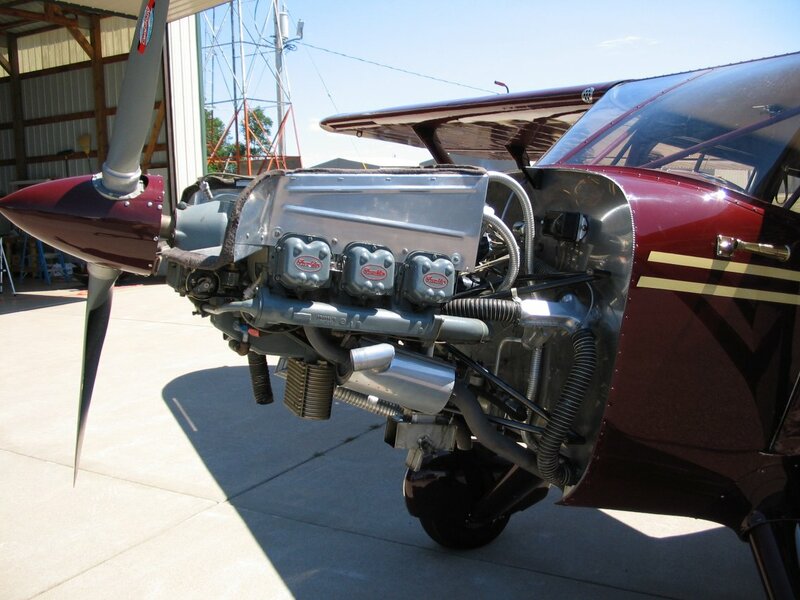 You can also see the split cowling that makes maintenance possible without removing the prop. 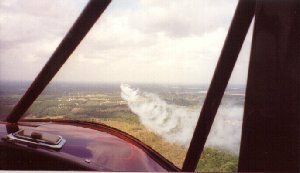 On the left, downwind at Sun 'n' Fun, behind a biplane with air show smoke. 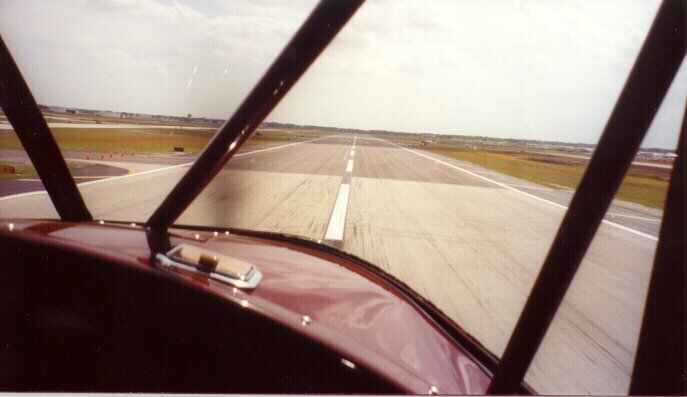 On the right, short final at Lakeland for a perfect wheel landing. More photos of NC6233M, sent by Charles Hauser, who refers to himself as the "custodian of Butch's NC6233M." The last three photos are of the run up of the Franklin 180 during an annual inspection just before Oshkosh 2005. 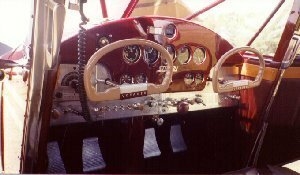 Butch is at the controls in these photos. Charles comments: "I think the photos with the cowl off show how nicely the 180 fits the airframe. This airplane is a joy to fly. Really smooth and balanced."